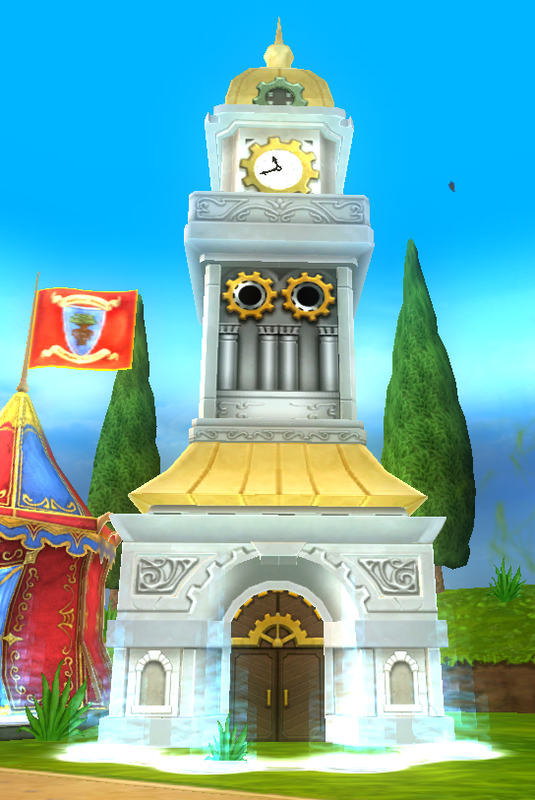 The highlight of this bundle, The Great Clock Tower, will give you a new adventure to test your skills. But what exactly is in this new gauntlet? Upon entering the dungeon, you’ll meet Bernado Dondi. He will accompany you in all 4 fights in this dungeon and supplies a 5% universal resistance boost. 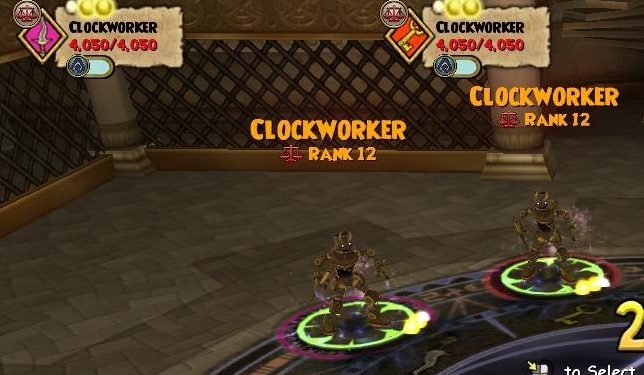 Your first fight consists of 2 Clockworkers (Balance, 4,050 health), but more will appear with more than 2 players inside. They might have a screw or two loose, but you can treat this as a normal mob battle. 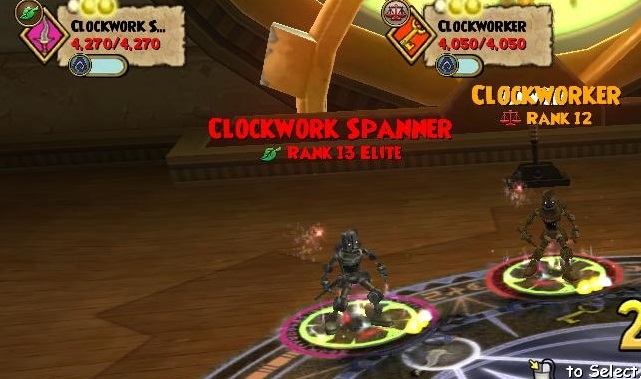 The second fight consists of a Clockworker (Balance, 4,050 health), and a Clockwork Spanner (Life, 4,270 health). As with the first mob battle, more enemies will come if you have more players in the battle. You can smash them as you would any other mob battle. Here is where things get interesting! 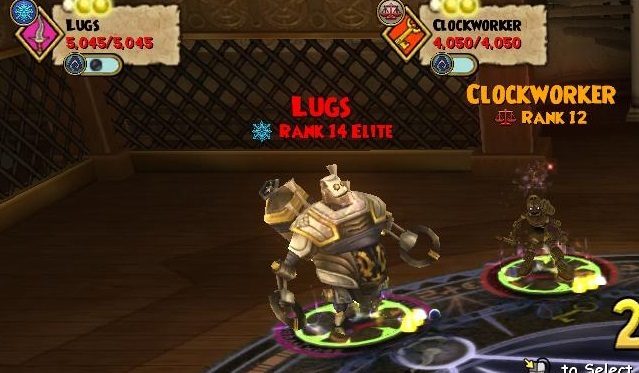 Your third battle has you going up against Lugs (Ice, 5,045 health) and his Clockworker (Balance, 4,050 health). More minions will appear if more wizards are in the battle. Both the boss and his minions are stunnable. Unlike the previous 2 fights, Lugs has some tricks up his sleeve! If anyone comes into the battle late, Lugs will interrupt to shout “Tardiness Will Not Be Tolerated!” and cast a Mana Burn on any late wizards. At the beginning of round 1, Lugs will interrupt to say “Better Keep My Guard Up!” and cast a -99% Tower Shield. If you attempt to pierce or shatter the -99% shield, Lugs will interrupt to say “Sneaky, Sneaky, Better Keep My Guard Up!” and steal 1 of your shields. At the end of round 3, Lugs will shout “Ooo, You’re Going To Get It … “ which acts as a warning. (He will repeat this phrase every 4 rounds after – so round 7,11, etc..). If you hit Lugs the round following his warning phrase, Lugs will say “Ugh! You Got Lucky This Time” which will result in two things. 1: He will skip his punishing natural attack for that particular cycle. So if for example you attack him on round 4, you won’t see his “boom” at the end of round 4, but you WILL see it at the end of round 8 if you don’t hit him again during round 8. 2: He will COMPLETELY stop replacing his -99% Tower Shields for the rest of the battle. If you cast any kind of dispel on Lugs, he will interrupt to shout “Time To Tidy Up A Bit” and remove all negative charms. If you cast any kind of feint (including pet feint! ), Lugs will interrupt to say “You Think You’re Clever, Huh?” and swap the two different traps. You will end up with the 70% trap, and Lugs will have the 30% trap. Conviction the first round. These enemies LOVE to stun and since this fight requires expert timing, it’s better not to risk an untimely one. Blade up your hammer for a big AOE hit. Traps are okay too, just make sure to avoid feints … they just aren’t worth it. Shatter and hit on round 4. Shatter will trigger Lugs to steal one of your shields (if you have any), but that won’t happen until after the hit is complete. Hitting on round 4 will fulfill his warning and prevent his big “boom” attack should your hit come up short. And most importantly, hitting Lugs this round will prevent him from recasting his -99% Tower Shield. So even if you need to do some cleanup, you won’t need to shatter again. 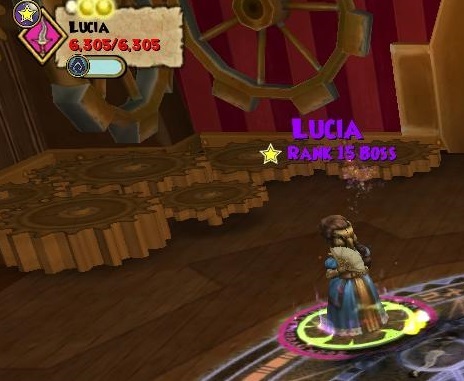 Your final battle pits you against Lucia (Star, 6,305 health). Lucia resists Fire, Ice, and Storm, and boosts to Myth, Life, and Death. Just like Lugs, she doesn’t go down so easy! If anyone comes into the battle late, Lucia will interrupt to shout “Tardiness Will Not Be Tolerated!” and cast a Mana Burn on any late wizards. 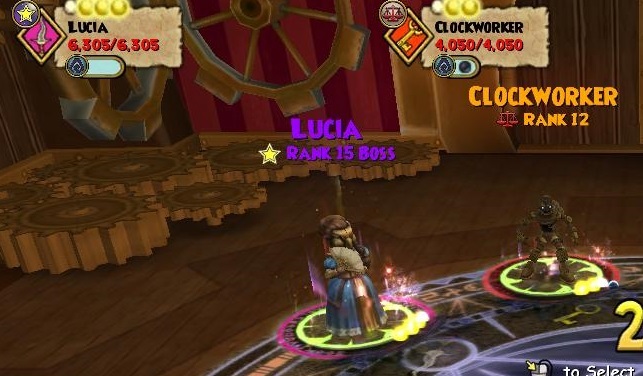 At the beginning of round 1, Lucia will interrupt to say “Let’s Even The Odds!” and summon a Clockworker (Balance, 4,050 health) minion. If you are with a team, she will summon more depending on how many people are in the battle. To even the odds, there will be 1 minion for 2 players, 2 minions for 3 players, and 3 minions for 4 players. While Lucia is not stunnable, her minions are. Every 4 rounds, starting at the beginning of round 4, Lucia will interrupt to shout “This Is My Show! Mine!” which will remove all charms from your entire team. If you cast any kind of dispel on Lucia, she will interrupt to say “Time To Even The Score A Bit!” and remove all negative charms. If you cast any traps, Lucia will interrupt to shout “The Star Is Only As Good As Her Supporting Cast!” and give her and all of her minions a 30% Bladestorm, a 20% Precision, a 10% universal pierce blade, and a 30% Brilliant Light. If you cast any type of feint (including pet feint! ), Lucia will interrupt to say “I’ve No Time For Such Frivolity!” and remove all wards currently on her. Blade up your hammer for a big AOE hit. These enemies deal a lot of damage, try to avoid traps which boost your enemies’ attacks even more. Shatter and hit on round 3. The blade removal occurs every 4 rounds, so you want to hit before then. Even if you don’t think your attack will kill all of the enemies, hit anyway! If you do come up short, you can use the next 4 rounds to blade up once again and hit on round 7. Lucia’s minions love to elemental shield and spirit shield her, so having shatter handy would be extremely helpful. And with that, congrats on finishing The Great Clock gauntlet! Let me know if you find any good drops. 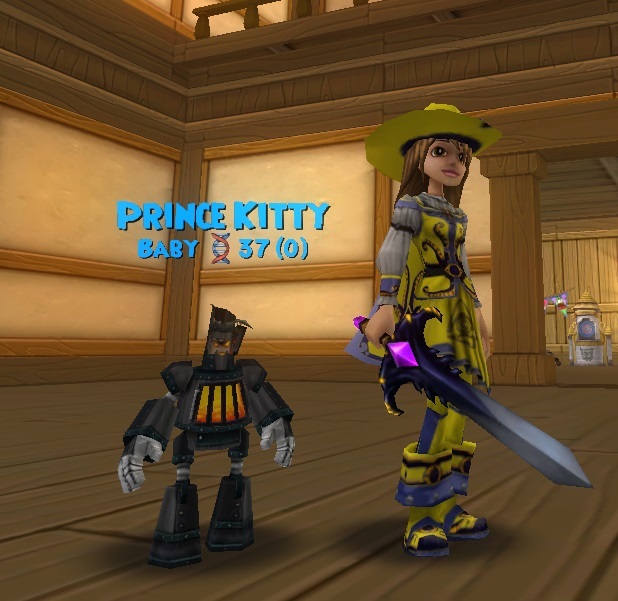 So far I’ve gotten this dropped Steel Golem pet – it’s pretty cool looking!